Fertilisers are given to improve plant growth rates and to boost yields of flowers or fruit. However, feeding plants is not always necessary. Sometimes looking after the soil is more important and enables plants to access nutrients already present in the ground. Applying fertiliser before planting. Credit:Tim Sandall/RHS The Garden. Is it necessary to feed plants? Containerised plants need regular feeding, as they only have what you give them. 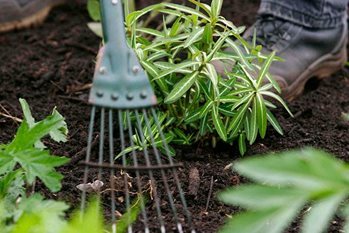 Plants in beds and borders, by contrast, are able to use the resources present in the garden soil, and may not need feeding. Ornamental trees and shrubs in garden soil may not need regular feeding by fertiliser. Some crops that do benefit from regular fertiliser are: fruit, vegetables and bedding plants. Gardeners often assume that poor growth in garden plants is related to lack of soil nutrients and give fertiliser. In fact, results from the RHS Soil Analysis Service show that shortages of plant nutrients in the soil are quite rare. Usually poor growth is due to other environmental factors such as drought, waterlogging and weather damage. Pests and dieases are also responsible for plants making poor growth. Soils vary in their nutrient levels. Sandy soils and chalky soils tend to be lower in nutrients than clay or loam soils. Soils also vary in the availability of nutrients. Soils that are dry, waterlogged, very acid or very alkaline may not allow plants to access existing nutrients. Correcting these factors (where possible) may be more effective than giving fertiliser, and in fact may be necessary for fertilisers to be effective. Are showing signs of nutrient deficiency. Are producing lower than expected yields of flowers or fruit, or are putting on less growth than expected (but appear otherwise healthy and are growing in suitable conditions). Feeding is usually done in spring or summer, during the growing season. Few plants need fertiliser in the winter months, even if they are winter-flowering. Some organic fertilisers, such as fish blood and bone or poultry manure pellets, are slow to release their nutrients and are applied in late winter or early spring in preparation for the growing season. Fertilisers are concentrated sources of plant nutrients. They feed plants rather than feeding the soil. There are many different types of fertilisers available, all with different nutrient values. Our advice on fertilisers gives more information on the types available and when you would use them. Garden compost, well-rotted manure, spent mushroom compost, poultry manure and seaweed are also used to feed plants, but contain much lower concentrations of plant nutrients. These compounds are very good for soil structure and fertility. Using them as soil conditioners or mulch helps make the plant nutrients already present in the soil more available to plant roots. See our advice on fertilisers for information on the different types available on the market and how to apply them. When applying fertilisers to the soil around plant roots, make sure that the soil is moist. Fertilisers are less effective in dry soil, and may cause scorching of plant roots. Over-application of potassium can interfere with plants’ ability to take up magnesium, causing magnesium deficiency. See our advice on nutrient deficiencies for more on identifying and dealing with this problem. Fertiliser may not be effective if applied to compacted soil. Soil cultivation is necessary to relieve the compaction and improve plant growth. Allowing fertilisers to touch plant leaves can cause leaf scorch. Only fertilisers designed to be applied to leaves should come into contact with them.